The Eva Solo Hurricane Lamp brings light and atmosphere to the patio, balcony or to the garden. An innovative reinterpretation of the classic outdoor lamp which, with its flickering candle, is perfect for adding an extra dimension of atmosphere to any occasion, both inside and outdoors. The design is light and airy with an elegant glass chimney resting on a stainless steel and silicone base. Designed for candles or tea lights, the Eva Solo hurricane lamp consists of an elegant glass chimney and a silicone base enclosed by a stainless steel ring with a removable metal plate on which the candle sits. 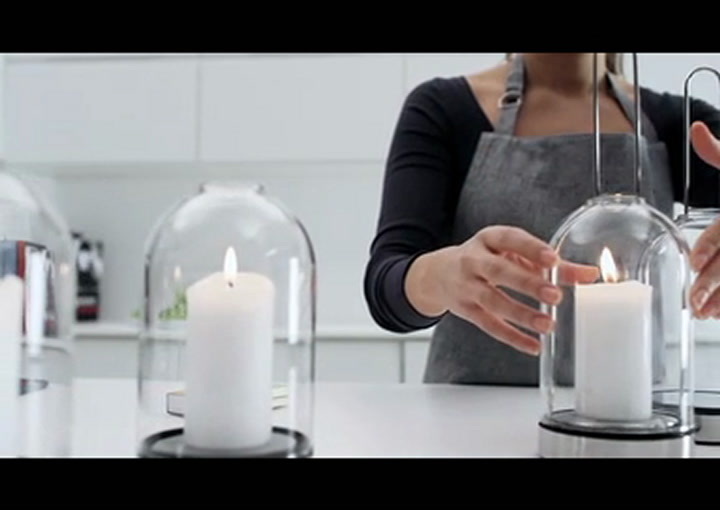 The base has a practical silicone reservoir which holds the wax flowing from the lit candle. The base is also flexible, so the wax can easily be loosened and removed before rinsing the reservoir in cold or hot water and replacing it. There is an air hole in the bottom of the lamp which ensures an adequate supply of air to the candle so it burns uniformly with minimal sooting. The ridges in the base also ensure ventilation and that the lamp sits securely on the table. The Eva Solo hurricane lamp is ingeniously functional and stylish lighting that will add the perfect touch to any home. View more from Candles & Candle Holders, Outdoor Decor, Eva Solo Outdoor. Very elegant hurricane lamp - looks good on my patio.